— Why is back pain so common? And why do most people get only temporary relief from medication or therapy? — If arthritis is caused by aging, as people say, why is it normally in only some joints, one hand, foot, or hip joint, for example? Both hands, etc., are the same age, after all, with the same genes and blood supply. — Many people exercise, yet also have back pain, breathing problems, or painful knees, necks, or shoulders. Could their problems be partly a result of the exercise? Is there any exercise that reliably helps heal chronic pain? These and similar questions inspired Steven Shafarman to create FlexAware. Steven studied philosophy and human development in college, and a few months after graduating he met Dr. Moshe Feldenkrais, engineer, judo master, neuroscientist, and creator of the Feldenkrais Method. 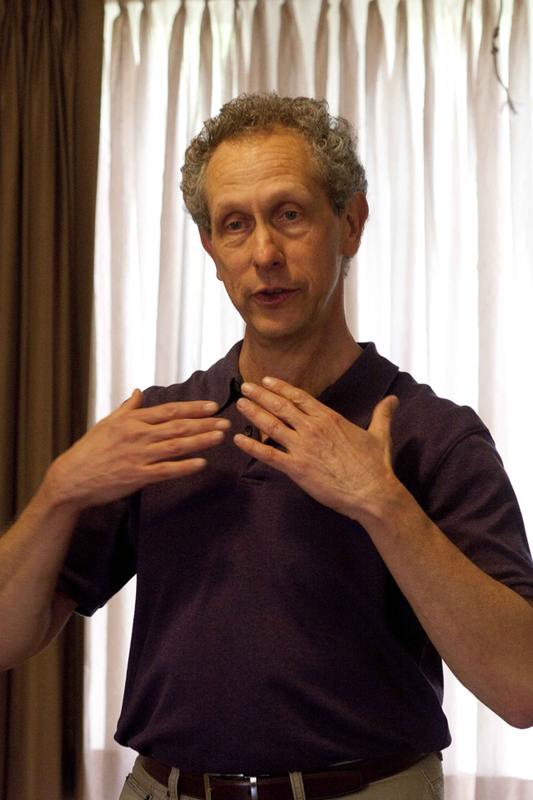 Steven then enrolled in the Feldenkrais Professional Training Program. The last time Dr. Feldenkrais taught in the United States was 1981, and he invited Steven to accompany him on several trips. 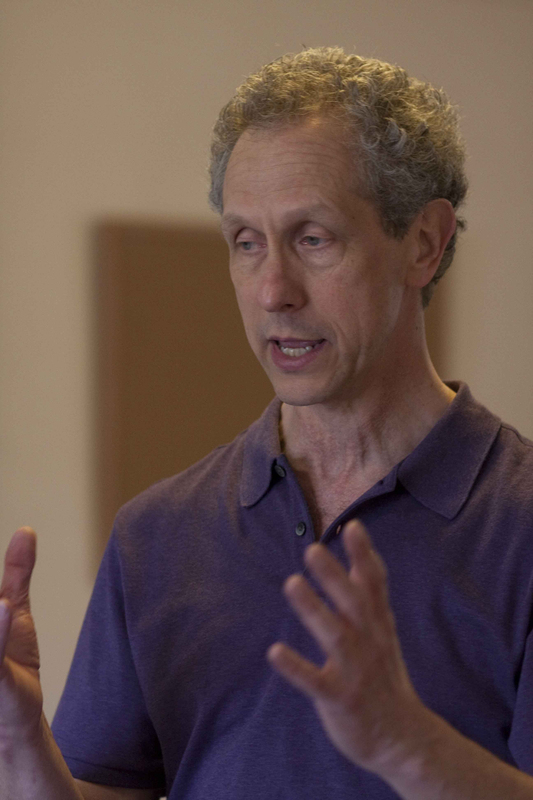 As a Feldenkrais Method practitioner, Steven has taught in Europe, Israel, Argentina, Australia, and around the United States. He is the author of six books, including Awareness Heals: The Feldenkrais Method for Dynamic Health (1997). In the early 1990s, as gyms and health clubs became more popular, Steven noticed a disturbing trend. Increasing numbers of people were seeking relief from exercise-related pain. Almost everyone improved while working with Steven, but many had setbacks when they returned to the gym. Curious, concerned, and eager to help his students, he started to look more closely at how people exercise. The Santa Barbara County Regional Health Authority, the health care provider for low-income residents, invited Steven to create an intensive Feldenkrais Method program in 1995. Participants had long-term chronic pain, including back pain, migraine headaches, and other musculoskeletal and stress-related conditions, including pain subsequent to serious accidents. Several participants tried to exercise but had setbacks, and asked Steven to teach them how to exercise without hurting themselves. He did his best, though he was not satisfied. Awareness Heals was published in 1997. While writing it, Steven reexamined the core ideas in the Feldenkrais Method. He then enrolled in a doctoral program in human development, seeking to understand the way young children learn to crawl, walk, talk, and make sense of the world. Young children are extremely flexible, remarkably strong, and have immense stamina — without any formal exercise. How do they do it? What do they know, that we’ve lost or forgotten? • Young children don’t worry about what’s right or proper; adults want to look good. • Young children explore and experiment, playfully, spontaneously; adults exercise with goals and schedules. • Young children are exquisitely attentive to their comfort at every moment; adults normally exercise while distracted by TV, music, phone calls, audio books, and such. • Young children are rarely still, except when asleep; adults sit for many hours in cars or at computers, moving mainly our fingers, hands, arms, eyes, and mouths. These observations guided Steven as he examined various exercises and studied anatomy, physiology, neuroscience, and early child development. A lot of his research was experiential, exploring fitness practices while actively imagining what it’s like to be a healthy young child. His goal: to create a fitness practice that helps adults regain, recreate, or rediscover the natural ease and skill each of us had when we were kids. The key to young children’s flexibility, strength, and stamina, Steven found, is that they move efficiently. Their breathing is free and fully integrated. They align with gravity, always working with it, not fighting it. Their muscles function harmoniously, with low even tone throughout the body, no excess effort. Over time, however, each of us acquires habits of straining, stiffening, and holding our breath. Those habits are partly a result of the way we exercise. While doing push-ups, for example, the trunk and hip joints are relatively rigid, and we normally hold our breath. The movement is, by design, artificial and arbitrary, the opposite of how young children move. • enhance movement skills in everyday activities, especially walking. He taught his first classes in the fall of 2001, and started using the name FlexAware in early 2003. One reason is that we’re mostly unaware of how we breathe, sit, and walk. We’re particularly unaware of our mid- and upper backs, an area where nearly everyone is relatively immobile. That immobility irritates or inflames tissues there and elsewhere. With every step, there’s excess pressure on the nerves, discs, and other tissues in the low back and elsewhere. Arthritis, like back pain, involves habits of inefficient movement. Each of us has various asymmetries, favoring one hand, standing with more weight on one leg, and so on. The effects are cumulative, and tissues in and around the joints respond by adding calcium. Although genes and nutrition have a role, movement variables are far more significant. — “Many people exercise, yet also have back pain, breathing problems, or painful knees, necks, or shoulders. Could their problems be partly a result of the exercise? When we move inefficiently, especially when the inefficiencies are habitual, exercise strengthens any imbalances. Tight muscles get stronger and tighter, joint tissues more inflamed or calcified. To promote healing, exercise movements have to pleasant and efficient, while also increasing the range of movement in joints and other tisuses. Comfort is fundamental, and this is a basic fact of neuroscience, [the Weber-Fechner law.] Also fundamental is learning to move easily and efficiently in everyday activities. FlexAware actively encourages us to be more aware and skillful. It’s exercise that educates. Steven released the first FlexAware DVD in 2010, working with Heidi Thompson and others. That was also the year he met Dr. Stephen Levin, the pioneer of biotensegrity movement science. Steve was already applying biotensegrity, which has many parallels with Dr. Feldenkrais’ intuitions, and Dr. Levin’s recent work added significantly. The first full formal FlexAware teacher education program was in the spring of 2011. Several smaller programs followed over the next few years. In 2012-13, Steven began working with some of his students to create FlexAware Yoga and FlexAware Pilates, while also creating specialized programs for seniors, people with chronic back pain, people with hip joint problems, and athletes. Steven is especially eager to work with researchers to document the efficacy of FlexAware. Feldenkrais® and Feldenkrais Method® are registered service marks of the FELDENKRAIS GUILD® of North America.